For lighting religious spaces, lighting designers usually build the lighting system in such a way that it can be hidden away and not detract from the space’s original design while providing adequate lighting that also highlights the building’s architectural flourishes. 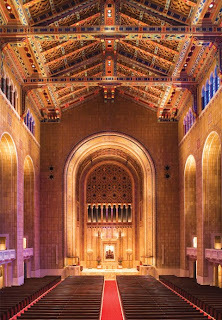 This was the challenge lighting designers faced at Temple Emanu-El, one of New York City’s most famous and prominent synagogues. 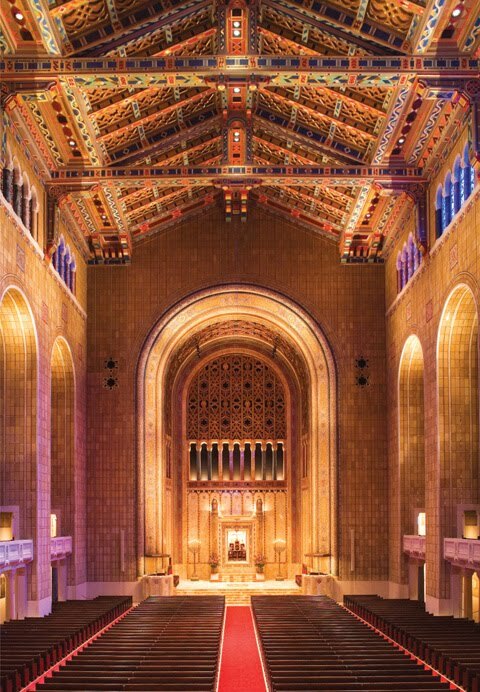 Originally built in 1927, Temple Emanu-El has some beautiful architectural features that lighting designers wanted to celebrate with their lighting. Above the house hangs a fantastic Lombardian ceiling. The entire structure is lined by fantastic stained glass and sections of mosaic work. As is common in synogogues, the lighting designers wanted to highlight the Bimah, the area of the synagogue where the reading of the Torah and other ceremonial activities take place. Built into the 70ft arch that frames the Bimah, designers installed 750w bulbs and PAR cans, in order supply the Bimah with rich, white light. The lighting designers also accented the area directly above the Bimah where the choir sings with warm color temperature compact fluorescent bulbs. The ornate stained glass windows were also set off using new lighting designs. Installed into the bases of the window sills were halogen MR16s.Halogen MR16s are ideal for display purposes and particularly well suited for illuminating reflective surfaces because their high CRI white light makes them glitter in an appealing way. Metal halide lamps were also installed into the ceiling to add supplementary daylight-like lighting. Architectural Lighting Magazine noted that the congregants were very excited by the new lighting, and that the exceptional daylight-like lighting of the halogen MR16s, the 750w PARs, and the metal halide lamps worked together to draw attention and accentuate the architecture of Temple Emanu-El. BulbAmerica carries a wide selection of MR16s, PAR lamps, and metal halide bulbs so you can create an exceptional daylight-like lighting system for your home, office, house of worship, or any other space. Check out what we have to offer today! Don’t hesitate to leave a comment or question on our blog or Facebook or call us at 1-877-622-0897 either.